Every December, the city of Amsterdam is awash in the holiday spirit: Famous squares turn to winter holiday markets and ice rinks and stalls reward those who brave the outdoors with sweet treats. Additionally, if you can manage to brave the brisk weather, Amsterdam has the same variety of stellar museum exhibits and live performances as it does most of the year, but with far fewer crowds—and those who can cross a few names off their Christmas list here will also find considerably emptier stores than in the United States. 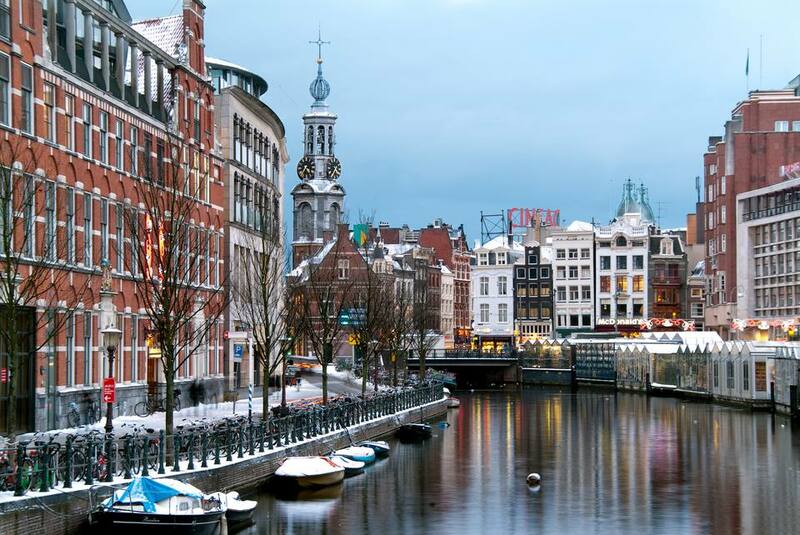 Amsterdam in December is rather cold but rarely experiences freezing temperatures. December is also the city's rainiest month, getting an average of a little over 3 inches over the course of 15 days, meaning you'll need to bundle up extra against the cold rain water no matter what time of the month you visit. Additionally, the days are also at their shortest this time of year, and by the end of December, the sun falls at around 4:30 p.m. Furthermore, the city usually experiences mostly cloudy to overcast skies throughout the month, meaning you'll only really get a few hours of direct sunlight each day—even on the best days of December. Since December is wet and cold for most of the month, your packing priorities should revolve around staying warm and dry. Bring plenty of long-sleeved shirts, sweaters, pants, and clothing you can layer to adjust for the varying temperatures as well as a heavy winter coat (preferably waterproof), insulated shoes and socks, a wool hat and gloves, and an umbrella. You may also want to pack thermal undergarments if you plan to be outdoors for long periods of time, though these may not be necessary if you're used to temperatures right above freezing. Although most of the month is occupied by festive holiday celebrations—starting with Sinterklaas Eve on December 4 and lasting through Kerst (Christmas) and Oud en Nieuw (New Year's Eve)—Amsterdam offers a wide variety of events, parties, and attractions everyone can enjoy in December, regardless of the weather. Sinterklaas: To prepare for the holiday (and the arrival of the man by the same name), Dutch children will set their shoes next to the fireplace at bedtime on the night before Sinterklaas (Sinterklaas Eve, December 4) in the hope that he will reward them with treats. Popular favorites include chocolate letters and a variety of spiced cookies, from speculaas bricks to bite-sized pepernoten and kruidnoten. The holiday culminates in family celebrations on December 5. Amsterdam Light Festival: An annual celebration of illuminated art in Amsterdam's City Center takes place from early December through late January each year and features some of the largest light artworks and installations in the region. Kerst (Christmas Day): On December 25, Amsterdammers also celebrate the Christian holiday—which they call Kerst—with a variety of unique and international customs. Tweede Kerstdag (Second Day of Christmas): If your holiday spirit still isn't satiated, there's yet another day of Christmas observed in the Netherlands. The Dutch take this national holiday to visit relatives or to shop, especially for furniture—a tradition that's repeated with even more fervor on the second day of Easter. Tangotrain: A festival all about tango music that runs the last week of December each year and invites collaborators from around the world to celebrate this festive musical style with a variety of parades, recitals, parties, and colorful events. Oud en Nieuw (New Year's Eve): Amsterdam residents ring in the new year with parties across the city. From comedy shows to music-driven dance parties, everyone can find a celebration to fit their tastes. Airfares and hotel rates are at an off-peak low but beware of price hikes around the winter holidays. The tourist crowds have vanished this month, so intrepid December visitors have the run of Amsterdam's popular attractions and restaurants. With Sinterklaas celebrated on December 5 and two days of Christmas in the Netherlands, expect special holiday events, markets, and seasonal treats all month. Be sure to try seasonal treats like koek en zopie (cake and a spiced alcoholic drink), warme chocolademelk (Dutch hot cocoa, richer than the American version), and Gluhwein (German mulled wine, also known as wassel) at the holiday markets—you're sure to enjoy these limited-time delicacies. The last days of December are also the only time of the year when fireworks sales are permitted, so stock them up and set them off with the rest of the city on the December 31.